A new Press Release has been published about the May 26, 2018 debut of Twist’s new Music Video, Our Common Humanity, in a live concert at the San Francisco International Arts Festival. See it HERE. San Francisco, September 19, 2016. One of San Francisco’s favorite cabaret entertainers, the multi-talented, multi-lingual Lua Hadar sings her own brand of cosmopolitan jazz, backed by her band Twist. Her latest show plays Nov.10 at Feinstein’s at the Nikko, When in Rome: Songs of the “La Dolce Vita” Era, featuring Italian and American jukebox hits from the 50s-60s. With this performance, the band celebrates the iTunes and Google Play release of their full-length concert film, “Like A Bridge,” recorded in 2012 at the legendary Fantasy Studios in Berkeley, CA. When in Rome: Songs of the “La Dolce Vita” Era features popular Italian and American hits by Ennio Morricone, Nino Rota, Luigi Tenco, Henry Mancini, Domenico Modugno and more, including such vintage favorites as Arrivederci Roma, Al di là, Volare and When in Rome, peppered with Lua’s humorous stories and a swinging band. Italian and English Vocals: Lua Hadar; Piano: Jason Martineau; Bass: Dan Feiszli; Drums: Kelly Park. Feinstein’s at the Nikko, 222 Mason Street, San Francisco. November 10 at 8pm. Tickets $25-40. http://www.feinsteinsatthenikko.com/event/1270811-lua-hadar-san-francisco/ Or by phone: 415-394-1188. As an indie performer-producer, Hadar has released three CDs with Music Director Jason Martineau and Twist. Twist’s most recent recording, the CD and DVD “Like A Bridge,” was nominated for an Independent Music Award and released at Yoshi’s Jazz Club in September of 2013 after its screen premiere at San Francisco’s Historic Balboa Theater. With its songs in seven languages, the full-length concert film “Like A Bridge” went live in September 2016 on iTunes and Google Play. Lua Hadar sings her own brand of cosmopolitan jazz influenced by pop, funk, folk, Latin and international cabaret. Instantly accessible and truly exotic, she has been molded by exchange experiences in places as diverse as Bali, Russia, Switzerland, Japan, Thailand, France and Italy. Her fascination with world cultures is reflected in the sophisticated song choices for her band, Twist. Hadar has charmed audiences from New York’s Iridium Jazz Club to Bangkok’s Thailand Cultural Center to the Swan Bar in Paris. She has performed numerous times at San Francisco’s legendary Fairmont Hotel, as well as The Plush Room, The Rrazz Room, Jazz at Pearl’s, Society Cabaret at Hotel Rex, Yoshi’s Jazz Club and Feinstein’s at the Nikko (Nov 2016). In addition to the Iridium, New York audiences have welcomed her home at Somethin’ Jazz Club and the Cornelia Street Café in Greenwich Village. Lua performed in Italy, Spain, Switzerland, and North America during her 5-year residency as an actor and singer with two Italian theater companies. She has been an Italophile since she can remember, living in Italy several years while touring as a performer, becoming fluent in the language and falling in love with all things Italian. San Francisco, CA, USA, September 20, 2015. San Francisco’s version of Italy’s comic cabaret festival, From the Shaman to the Showman, returns this year with some international fun. The San Francisco Italian Athletic Club, in the heart of North Beach, will be the scene of Year Three of CABARET COMICO, featuring the Bay Area’s funniest singers and songwriters performing original songs and musical comedy. For the first time since its inaugural 2013 event, CABARET COMICO welcomes representatives of our partner festival, From the Shaman to the Showman, for a truly international artistic and cultural experience. 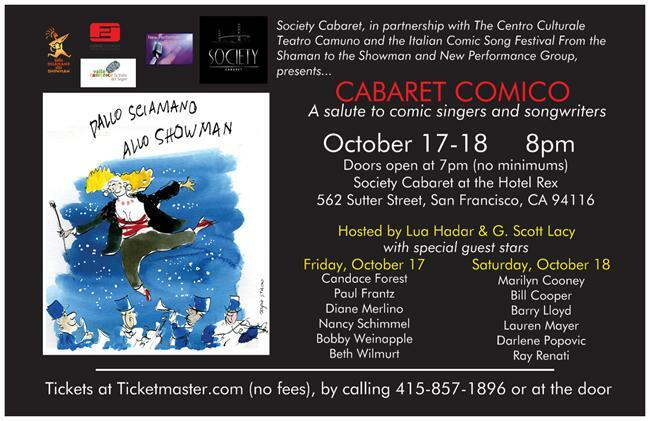 Cabaret Comico: A Salute to the Comic Singer & Songwriter, will be hosted by Lua Hadar. Taking our laughter seriously,a portion of the proceeds will be donated to UNCHR ITALY U.N. Refugee Agency. Starring: Rita Abrams, Kikelomo Adedeji, Lauralee Brown, Cecilia Capanna, Candace Forest & The Wild Women (Allison Lovejoy, Alexis Lane Jensen, Beth Wilmurt), Paul Frantz, Claudia Landivar, Ray Renati, Rene Sevieri and Brooke Michael Smith. A second performance event on Sunday, November 15 is planned at North Beach’s intimate cabaret and world music club, Peña Pachamama, and the Italian representatives will participate in an educational encounter with the schools on November 12, under the aegis of the Italian Cultural Institute. 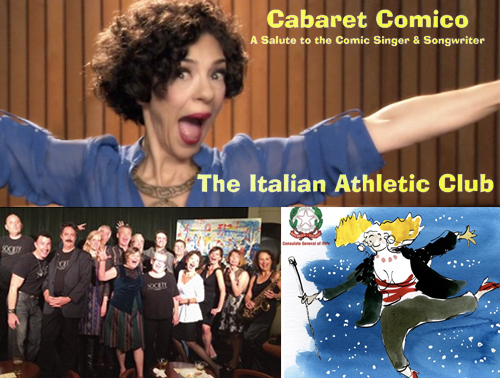 SHORT BLURB: The San Francisco Italian Athletic Club, in collaboration with the Italian Cultural Institute and New Performance Group presents the 2015 edition of Cabaret Comico: A Salute to Comic Singers and Songwriters. A full evening of original comic song and musical comedy, hosted by vocalist and emcee Lua Hadar. STARRING: Rita Abrams, Kikelomo Adedeji, Lauralee Brown, Cecilia Capanna, Candace Forest & The Wild Women (Allison Lovejoy, Alexis Lane Jensen, Beth Wilmurt), Paul Frantz, Claudia Landivar, Ray Renati, Rene Sevieri and Brooke Michael Smith. The San Francisco Italian Athletic Club, 1630 Stockton Street, San Francisco, CA 94133. A portion of the proceeds will be donated to UNCHR ITALY U.N. Refugee Agency. October 26, 2013 marked Chapter One of an international cultural exchange for the production of Cabaret Comico, a partnership of San Francisco’s Society Cabaret and New Performance Group with the Italian Centro Culturale Teatro Camuno, and their Festival Dallo Sciamano allo Showman (From the Shaman to the Showman), the cabaret festival of original comic songs and songwriters. In 2014, CABARET COMICO was awarded a Certificate of Honor from San Francisco’s Mayor, Ed Lee. The word ‘comic’ is key here; in Italy all cabaret is comic. Now in it’s 12th year in Italy’s Valle Camonica, Dallo Sciamano allo Showman is a co-production of Centro Culturale Teatro Camuno and the renowned festival of original song and songwriters, Club Tenco. Featuring many stars as well as emerging artists, it has been covered by Italian National Television RAI. The Valle Camonica, in the Lombardy Region of northern Italy, boasts a UNESCO site of prehistoric rock carvings, which have greatly influenced local artists and scholars, among them festival producer Nini Giacomelli and her creative team, who see the performer as a kind of shaman, healing the audience through laughter. Lua Hadar’s New Performance Group is dedicated to deepening intercultural communication through the performing arts, arts education and cultural exchange with the goal to bring an awareness of our common humanity to audiences and participants. New Performance Group has produced classes, performances, CDs, community events, international exchange and a DVD in its 20-year history. Nominated for an Independent Music Award, Lua Hadar is a vocalist, emcee and indie producer with a long history of performing both abroad (Italy, France, Thailand and more) and in New York and San Francisco, including at legendary North Beach music venues such as The Purple Onion, Peña Pachamama, Caffé Trieste and Jazz at Pearl’s. 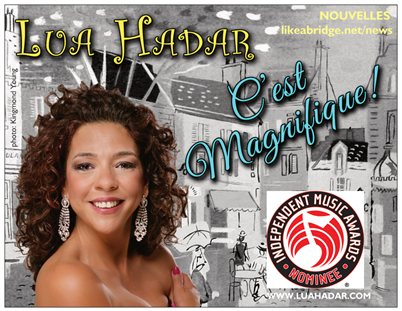 SAN FRANCISCO, June 12, 2015– To celebrate French Independence Day, Lua Hadar with Twist returns for an encore performance of their popular French Music Hall show, C’est Magnifique! This Bastille-Day-with-a-Twist features Lua on French and English vocals, Music Director Jason Martineau on piano, Dan Feiszli on bass, Kelly Park on drums, and special guest Dave Sturdevant on guitar and harmonica. Saturday, July 11 at 8pm (seating from 7pm) at Society Cabaret at the Hotel Rex Union Square, 562 Sutter Street, San Francisco. Tickets start at $25 (NO FEES) at Ticketmaster or societycabaret.com Or call 415-857-1896. Full bar, great food. More info at www.luahadar.com. The show presents a variety of songs from the popular traditions of Paris, including those of American songwriter Cole Porter; hence the title C’est Magnifique!, a song from Cole Porter’s 1953 musical, Can-Can. Dave Sturdevant’s harmonica brings a Toots Thielemans style to the show, in addition to the rhythm of his swinging guitar. Hadar is no stranger to France or French music. She’s recently returned from teaching a Master Class on American Jazz Standards in France and has performing twice in Paris. Since its inception in 2007, Hadar’s cosmopolitan jazz ensemble TWIST has developed a multi-lingual world jazz fusion that twists the styles of international standards and brings new material into the jazz idiom.Lua has charmed audiences from New York’s Iridium Jazz Club to Bangkok’s Thailand Cultural Center to the Swan Bar in Paris, where, on a return engagement, she previewed C’est Magnifique! to an enthusiastic full house before bringing it to San Francisco’s Society Cabaret for its first run in November 2013. 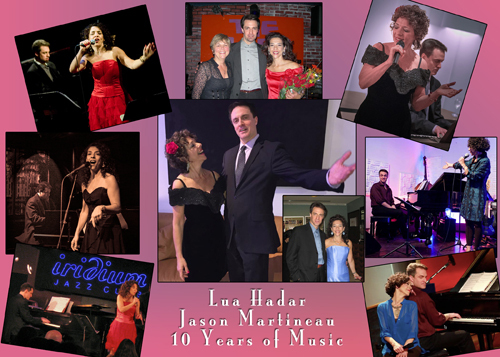 The show was reprised last year and became a Society Cabaret tradition, presented each time with a different featured instrumentalist.Hadar has released three CDs with Music Director Jason Martineau and Twist. The most recent, Like A Bridge, was recorded in 2012 as the centerpiece of her Bridges Project. 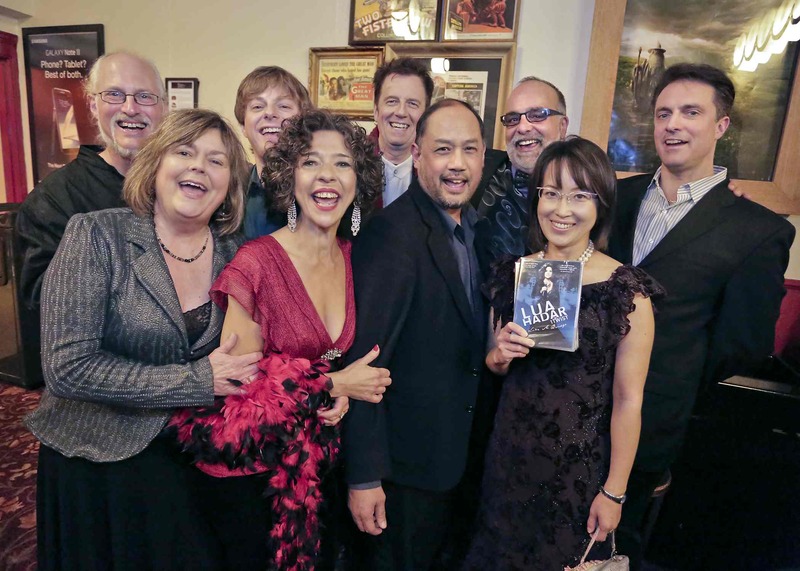 The Like A Bridge DVD was nominated for an Independent Music Award and was released at Yoshi’s Jazz Club in Oakland in September of 2013 after its premiere at San Francisco’s Historic Balboa Theater. ...such a lovely variety of songs from cabaret traditions of Paris (and beyond), that we might as well have been in a brick-walled basement room in the Quartier Latin. – Talkin’ BroadwayFirst call band of international talent and an innate gift of swing. – Critical JazzAn artist with excellent, eclectic tastes. – Palo Alto Daily NewsLua Hadar has always delighted listeners with her ability to cross all barriers and create a cosmopolitan jazz sound. – EMusic.comFor more information on Lua Hadar with Twist, see luahadar.com, iTunes, youtube, Facebook, twitter and most major music sites. Lua Hadar with her band Twist in their French Music Hall style cabaret show, C’est Magnifique! Seating begins at 7pm. Full bar, great food. TICKETS start at $25 at Ticketmaster. NO FEES. Lua on French and English vocals, Jason Martineau on piano, Dan Feiszli on bass, Kelly Park on drums, Dave Sturdevant on guitar and harmonica. Just yards away from their sold-out 2005 debut at the legendary Purple Onion, Hadar and Martineau unite at the hip new venue in San Francisco’s North Beach for a 10-year anniversary Duo Concert. The Emerald Tablet, (a creativity salon run by Della Haywood and Lapo Guzzini) presents performances, exhibits, and workshops in a wide variety of fields. With a grand piano and an intimate space, the stage is set for the vocal and pianistic artistry of this virtuosic pair of performers. Martineau and Hadar began working together in 2005, when producer Candace Forest brought them together for Lua’s first solo recording project, It’s About Time. Since then, they formed Twist and have collaborated on three CDs and a DVD, performing live shows in New York, Los Angeles, Bangkok and many Bay Area venues, including the renowned jazz venue, Yoshi’s. Martineau’s skilled and sensitive arrangements utilize Hadar’s wide range of vocal styles and languages, bringing classic tunes into jazz from far-flung places on the planet as Japan, Madagascar, Brazil, France and Italy. Hadar is no stranger to North Beach clubs, having performed and hosted many events through the years at The Purple Onion (http://purpleonionlive.com), Peña Pachamama (http://pachamamacenter.org) and Jazz at Pearl’s (http://www.jazzwest.com/articles/pearls_closing.html). In her early years in San Francisco Lua performed frequently at the famous Caffè Trieste, rubbing elbows with musicians and bohemians such as the late painter Lorant Chovan, who created many images of the chanteuse. The late painter Lorant Chovan created numerous images of the chanteuse. San Francisco’s version of Italy’s comic cabaret festival, From the Shaman to the Showman, returns this year with double the fun. Society Cabaret presents two different nights of the Bay Area’s funniest singers and songwriters performing original songs and comic numbers from musical theater in the 2014 edition of Cabaret Comico: A salute to comic singers and songwriters, hosted by G. Scott Lacy and Lua Hadar. October 26, 2013 marked Chapter One of an international cultural exchange for the production of Cabaret Comico, a partnership of San Francisco’s Society Cabaret and New Performance Group with the Italian Centro Culturale Teatro Camuno, and their Festival Dallo Sciamano allo Showman (From the Shaman to the Showman), the cabaret festival of original comic songs and songwriters. The word ‘comic’ is key here; in Italy all cabaret is comic. HOW: Tickets (NO FEES) at Ticketmaster.com http://bit.ly/1lX2JJ5 or call 415-857-1896, or at the door. 8:00 PM Cabaret Comico: A Salute to Comic Singers and Songwriters. Special Guest Stars: Candace Forest, Paul Frantz, Diane Merlino, Nancy Schimmel, and Bobby Weinapple, Beth Wilmurt. 8:00 PM Cabaret Comico: A Salute to Comic Singers and Songwriters. Special Guest Stars: Marilyn Cooney, Bill Cooper, Barry Lloyd, Lauren Mayer, Darlene Popovic, and Ray Renati. Now in it’s 11th year in Italy’s Valle Camonica, Dallo Sciamano allo Showman is a co-production of Centro Culturale Teatro Camuno and the renowned festival of original song and songwriters, Club Tenco. Featuring many stars as well as emerging artists, it has been covered by Italian National Television RAI. The Valle Camonica, in the Lombardy Region of northern Italy, boasts a UNESCO site of prehistoric rock carvings, which have greatly influenced local artists and scholars, among them festival producer Nini Giacomelli and her creative team, who see the performer as a kind of shaman, healing the audience through laughter. Society Cabaret enters its second year of international co-production to expand last year’s 1-night pilot project to a 2-night event, with this year’s edition of Cabaret Comico. The star attraction at San Francisco’s Hotel Rex Union Square, Society Cabaret’s 75-seat house is a gem of a performance space, with sound, lights, a grand piano, cabaret tables, a full bar and a terrific kitchen. Society Cabaret’s four founding partners combine their individual artistic expertise to bring a cooperative vision to their thriving performance venue. Director of Entertainment, G. Scott Lacy, co-hosts both evenings together with Lua Hadar. To celebrate French Independence Day, Lua Hadar with Twist presents their popular French Music Hall show, C’est Magnifique! This Bastille-Day-with-a-Twist features, for the first time, the swing of Tom Bekeny’s jazz violin. Saturday, July 12 at 8pm (seating from 7pm) at Society Cabaret at the Hotel Rex Union Square, 562 Sutter Street, San Francisco. Tickets start at $30 (NO FEES) at Ticketmaster or http://www.societycabaret.com. Or call 415-857-1896. Full bar, great food. More info at http://www.likeabridge.net and http://www.luahadar.com. The show presents a variety of songs from the popular traditions of Paris, including those of the influential American songwriter, Cole Porter; hence the title C’est Magnifique!, a song from Cole Porter’s 1953 musical, Can-Can. Tom Bekeny’s Stephane Grappelli-style swing brings a gypsy jazz color to the show, in a new twist for Twist. French songs by Charles Trenet, Maxime LeForestier, Edith Piaf and Serge Gainsbourg round out the set list, and as ever, Lua’s humorous anecdotes provide her personalized bridge to the songs, whether you speak French or not. Since its inception in 2007, Hadar’s band TWIST has developed a reputation for twisting the style of international standards, performing original numbers and presenting songs in different languages. Lua has charmed audiences from Yoshi’s Jazz Club to Bangkok’s Thailand Cultural Center to the Swan Bar in Paris, where, on a return engagement, she previewed C’est Magnifique! to an enthusiastic full house before bringing it to San Francisco’s Society Cabaret for its first run in November 2013. Join us at Society Cabaret at the Hotel Rex Union Square, San Francisco to celebrate Bastille Day as Lua Hadar with Twist returns to present C’est Magnifique!. Parking is available at the Sutter-Stockton garage. Seating begins at 7pm for the 8pm show. A full bar and delicious menu are available at tables during the show, for a real cabaret experience. Lua on French and English vocals, Music Director Jason Martineau on piano, Dan Feiszli on bass, Kelly Park on drums, and featuring Tom Bekeny on jazz violin. See video below from our November 2013 debut of “C’est Magnifique!” at San Francisco’s Society Cabaret. The July 12 show features the jazz violin of Tom Bekeny instead of the jazz accordion of David Miotke, for some swinging new twists. 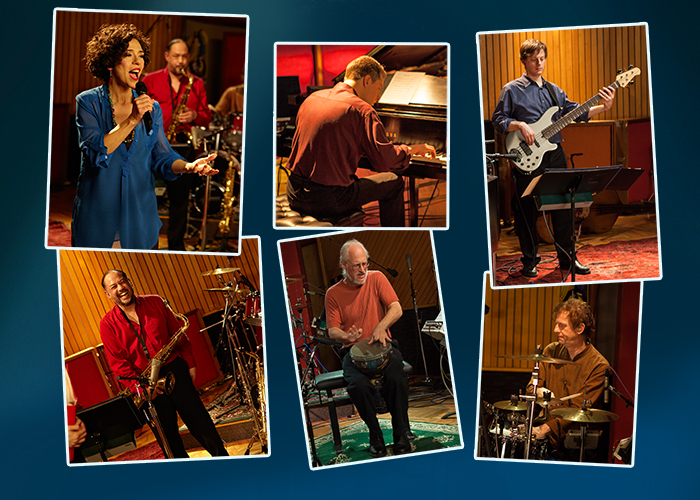 World jazz ensemble LUA HADAR with TWIST presents Like A Bridge: a 70-minute Live Studio Concert directed by Emmy-winner Lawrence Jordan, plus the bonus feature Building Bridges, on the origins of the band’s “cosmopolitan jazz” sound. Songs in seven languages weave the theme of world unity through this passionate, fun and eclectic performance by vocalist Lua Hadar and her band of top international musicians. Cosmopolitan jazz ensemble Lua Hadar with Twist and their latest release, Like A Bridge. 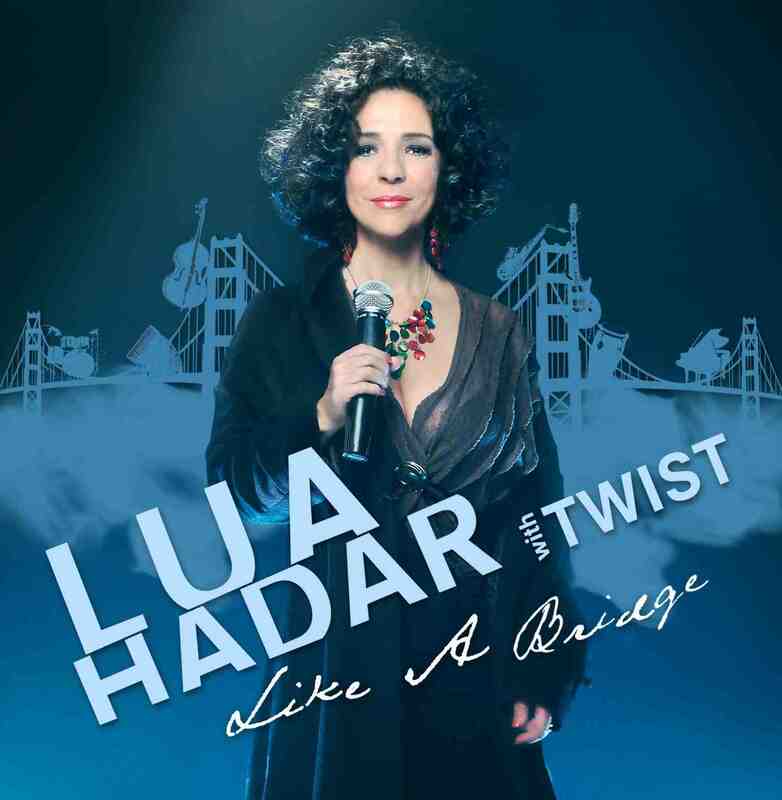 LUA HADAR with TWIST: Like A Bridge (CD and DVD) was recorded live at the legendary Fantasy Studios in Berkeley, California. Lua’s cosmopolitan jazz sound draws from many nationalities and styles, connected by our common humanity, with the Bridge as its symbol. CD sales: Amazon, Spotify, iTunes and most digital download services. The DVD is for sale at all live Lua Hadar with Twist shows. David Miotke on Jazz Accordion, Emil Miland on Cello, Fumiko Ozawa on Koto and Gideon Bendile with members of the Kalahari Experience Zulu Choir. San Francisco – Society Cabaret located in the Rex Hotel continues to bring exceptional talent to San Francisco. Direct from her acclaimed sell-out performance at the Swan Bar in PARIS, FRANCE. A unique and original vocalist with a soaring range, Lua interprets lyrics in both French and English with a charming, swinging delivery, as well as passionate commitment and humor. Lua sings her own brand of cosmopolitan jazz influenced by pop, funk, Latin and international cabaret. Instantly accessible and truly exotic, this Broadway-influenced performer has been molded by cultural exchange experiences in places as diverse as Bali, Russia, Switzerland, Japan, Thailand, France and Italy. Lua will be accompanied by her swinging cosmopolitan jazz band Twist. You’ll feel like you’re in a French Music Hall or a black and white movie as you enjoy stunning vocals in both French and English and wry stories of Hadar’s French connections. Jason Martineau on piano, Dan Feiszli on bass, Kelly Park on drums and featuring Dave Miotke on jazz accordion. The mission of her band is to create world harmony through music. The Hotel Rex is located at 562 Sutter Street between Powell and Mason. The Hotel Rex is San Francisco’s answer to the Algonquin. Surrounded by 1920’s and 30’s glamour guests can linger in the Library Bar for cocktails and conversation. An extensive menu of American classics with a European influence will be available in the cabaret room as small plates, as well as, a Pre Fixe dinner. Society Cabaret patrons will be immersed in an ambiance of arts and culture. C’est Magnifique: a love affair in any language, can be seen November 14, 15 and 16 @ 8pm.Doors open one hour prior to the performance. Tickets for C’EST MAGNIFIQUE may be purchased at Ticketmaster.com as well as SocietyCabaret.com. San Francisco, August 22, 2013: Fresh from a success in Paris, Lua Hadar brings her cosmopolitan jazz ensemble Twist back to Yoshi’s Oakland to celebrate the Official Release of their DVD, Like A Bridge. A 70-minute Live Studio Concert directed by Emmy award-winner Lawrence Jordan, Like a Bridge was shot at the legendary Fantasy Studios in Berkeley, and was nominated in the Long Form Video Category by the Independent Music Awards. On September 30, clips from the DVD will be shown on Yoshi’s new screen as the band rolls out some fresh new tunes live on stage. Music Director Jason Martineau on piano, Dan Feiszli on bass, Celso Alberti on drums, Ian Dogole on Global Percussion, Larry De La Cruz on reeds, and Hadar on vocals in seven languages. Cosmopolitan jazz ensemble Lua Hadar with Twist performs international standards with a different ‘twist’ on style; also presenting original and rarely performed songs in several languages. 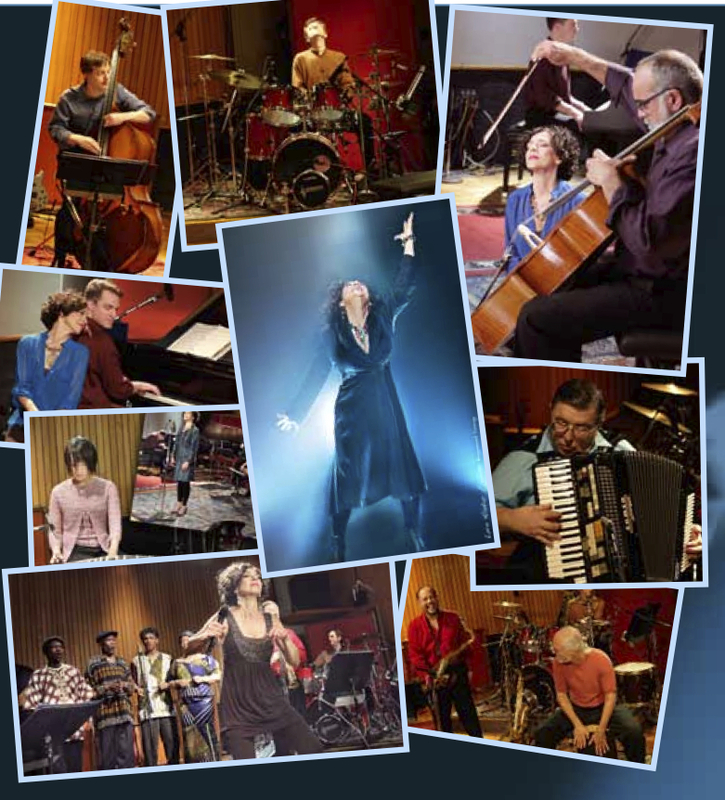 The DVD Like A Bridge includes a full length concert with the 13-piece ensemble directed by Emmy-winner Lawrence Jordan, plus the bonus feature Building Bridges, using the Bridge as a symbol for the interconnectedness each one of us can develop to foster world harmony. Songs of hope, courage and our common humanity in seven languages (English, French, Italian, Spanish, Portuguese, Japanese and Malagasy) weave the theme of world unity throughout this passionate, fun and eclectic performance by vocalist Lua Hadar and her band of top international musicians. Music Director Jason Martineau on piano, Dan Feiszli on bass, Celso Alberti on drums, Ian Dogole on Global Percussion, Larry De La Cruz on reeds, Emil Miland on cello, Fumiko Ozawa on koto, David Miotke on jazz accordion, and featuring South African performer Gideon Bendile and members of his Kalahari Experience Zulu Choir. Dave brings his unique jazz accordion sound to the band’s French songs, such as La Mer, with authentic color and skilled playing. He is a multi-talented singer, pianist, accordionist and composer, performing solo and with musical groups in styles as varied as jazz, cabaret, tango, Italian, strolling strings and classical. Dave holds music degrees with honors from Northwestern University and was a founding member and high lead singer/keyboardist with the well-known 60’s rock band, H. P. Lovecraft. Educational collaborations with Japan have introduced Lua to koto player Fumiko Ozawa, who this past year made her koto orchestra debut at San Francisco’s Herbst Theater. Fumiko started studying koto in 2004, with Mrs. Masazuka Sato, Head Master of Seiha Music School of Japan and USA. Fumiko obtained her teaching credential for koto music (Jun-Shihan, associate level) from the Seiha Music School in Tokyo, 2009. She guests with TWIST on their interpretation of the Japanese 1963 pop classic Ue o muite aruko, honoring the dignity of the Japanese to “walk with their heads up’” after the devastating earthquake and tsunami of March 2011. Emil made his Carnegie Hall debut in 2010 with Frederica von Stade in her farewell recital. In the same week he made his jazz debut with TWIST at New York’s Cornelia Street Café, and has contributed to Like A Bridge on the mystical Tom Jobim song, Imagina. A champion of new works for cello, he has given premieres of music written specifically for him by such composers as Ernst Bacon, David Carlson, Andrew Imbrie, Lou Harrison, Jake Heggie and Dwight Okamura. As a member of the San Francisco Opera Orchestra since 1988, he has collaborated with many famous singers in recital. Maxime Le Forestier’s pop song, Born Somewhere, advocates for immigration rights in both French and in Zulu. The compelling, upbeat performance features Lua’s French vocal, backed by South African performer Gideon Bendile, with members of his Kalahari Experience Zulu Choir. San Francisco, Californie, États-Unis: Peu après la nomination de son groupe pour un Prix Indie Music, la chanteuse Lua Hadar retourne au Swan Bar à Paris pour y présenter son nouveau spectacle, C’est Magnifique. Le club de musique de style des années 30, accueille à nouveau l’artiste de San Francisco Lua Hadar après le succès qu’elle a rencontré lors de son passage en 2009, avec son accompagniste de longue date Sheldon Forrest. Cette fois-ci, le jeune et talentueux bassiste Albin Suffys, de Lille, France, se joindra à eux. Ils joueront des morceaux de Cole Porter, Charles Trenet et quelques chansons d’amour des quatre coins du monde que Hadar sort de sa tour de Babel pour une vraie aventure amoureuse cosmopolite. 75006 Paris. Tél. : 01 44 27 05 84. Métros : Raspail – Vavin. La chanteuse Lua Hadar n’est pas étrangère à la Ville-lumière, ni à la France. Suite à sa prestation en 2009 au Swan Bar – bar de style Newyorkais – elle a participé à un concert dans le cadre d’un échange culturel en 2010, à Lille, avec Musiconoclast’ Orchestra. Ce concert, évènement principal de l’échange culturel, était produit et dirigé par le bassiste français Albin Suffys. Lua Hadar a également donné une master class en Interprétation vocale aux élèves de jazz de l’École municipale de musique et de danse de Lomme. Le concert parisien à venir est la cerise sur le gâteau après la récente nomination à un prix de musique indépendante pour le DVD de « jazz cosmopolitain », Lua Hadar with Twist: Like A Bridge, qu’ils célèbreront par un retour en septembre au fameux Yoshi’s Jazz Club à Oakland, Californie. Sheldon Forrest a commencé le piano à l’âge de 3 ans et il ne s’est jamais arrêté. Albin Suffys, un musicien singulier qui explore les possibilités de la basse électrique pour en faire le point de rencontre de toutes sortes de langages musicaux. Influencé par le jazz comme par la musique contemporaine, artiste complet et compositeur novateur, il invente et développe ses propres méthodes de travail sur son instrument. Après des études de musicologie, au cours desquelles il découvre la musique concrète, il a étudié en classe de jazz au conservatoire de Tourcoing et a été l’élève du contrebassiste Christophe Hache. Il poursuit son étude de la basse électrique à l’étranger, auprès de bassistes tels que Jeff Berlin (USA), Steve Lawson (Royaume Uni) ou encore Adam Nitti (Italie). Lors d’un séjour à San Francisco il se lie d’amitié avec le grand bassiste américain Michael Manring avec qui il perfectionne son jeu. C’est aussi l’occasion pour lui de démarrer une collaboration avec la chanteuse de jazz Lua Hadar et la compositrice Candace Forest en tant que musicien, arrangeur et compositeur. De retour en France et depuis 2010, il est enseignant à l’EF2M (Ecole de Formation aux Métiers de la Musique) à Tourcoing, il y enseigne notamment, en plus de la basse, l’arrangement, l’écriture, la section orchestrale, l’improvisation. Albin Suffys se produit généralement en solo ou au sein de ses nombreuses formations : il a créé notamment le duo “Zone de Basses Fréquences”, le quartet world-jazz “Atypia”, il est membre du trio jazz fusion “Idiorythmia” et fonde en 2010 l’orchestre jazz contemporain “Musiconoclast’ Orchestra” où il dirige un ensemble de douze musiciens. L’ensemble de jazz cosmopolite LUA HADAR with TWIST de San Francisco, Californie se retrouve en compétition avec plus de 300 artistes exceptionnels auto-publiés et de maisons de disques indépendantes, ainsi que des anciens des grands labels, tous nominés par le Music Resource Group (MRG) pour le 12ème Independent Music Awards (The IMAs), un prix prestigieux qui récompense les groupes indépendants et leurs publics. Une célébration de la démocratie de la créativité et du mérite du talent, le Independent Music Awards honore les artistes exceptionnels indépendants traditionnellement ignorés par les médias grand public et les circuits de distribution. Lua Hadar with Twist est nommée parmi une sélection d’artistes établis et d’artistes qui montent tels que Omar Sosa, Ben Kweller, Band Of Skulls, Bright Eyes, Langhorne Slim & The Law, Killer Mike, Paper Lions, Sarah Cheng-De Winne et The Congregation, sélectionnés parmi les nombreux artistes qui ont soumis leurs musiques publiées pendant la période d’éligibilité pour les 12ème IMA. sont sélectionnés, dans 80 catégories dont album, chanson, vidéo clip et art, parmi des milliers de candidatures d’Amérique du Nord, d’Amérique latine, Asie, Afrique, Australie, Groenland et Europe. Entrée: 5 Euros. Bar et petits plats. Vocalist Lua Hadar is no stranger to the City of Lights or to France. Her 2009 appearance at the New York-style Swan Bar lead to a 2010 cultural exchange concert in Lille with the Musiconoclast’ Orchestra, produced and music directed by French bassist Albin Suffys. The concert was the centerpiece of a cultural exchange which also featured Hadar teaching a master class in vocal performance to jazz students at the l’Ecole Municipale de Musique et de Danse de Lomme. The upcoming Paris performance comes on the heels of her band’s nomination for an Independent Music Award for their “cosmopolitan jazz” DVD, Lua Hadar with Twist: Like A Bridge, which they will celebrate with a September return to the renowned Yoshi’s Jazz Club in Oakland, California. Sheldon Forrest started on the piano at the age of 3 and has never stopped. Over the last 20 years in San Francisco, New York, and Paris, he has acted as a piano-bar pianist (playing jazz, blues, Latin, R&B, gospel, Broadway, arias/art songs, pop, rock, Neapolitan songs and chanson Française); a host and co-host for open-mic jams; a musical director for cabaret (co-created nearly 40 original shows in New York City over the course of one decade) and musical theater (professional, college, community theater and children’s theater); an arranger and collaborator on CD projects; a solo background player in restaurants; an ensemble player in several different formations and genres; a piano teacher; vocal coach; recital accompanist; teaching assistant (notably at American Academy of Dramatic Arts and American Musical and Dramatic Academy); music appreciation teacher; high-school choir director; and rehearsal, audition and orchestra pianist. International engagements include a comic song festival performance with vocal trio Lua Hadar and The Kitchenettes (Lombardy, Italy 2003) and in jazz trio at the Meriden President (Dakar, Senegal 2009). Currently Sheldon works for American Children’s Theater of Paris, the Bilingual Montessori School de l’Oise in Chantilly, and Paris Voices, the gospel choir of the French Ministry of the Interior. www.sheldonforrest.com. Albin Suffys is a unique musician who explores the possibilities of the bass guitar for a meeting point with many musical languages. Influenced by jazz as well as contemporary music, he is a complete artist and innovator who invents his own methods on his instrument. As a Conservatory student of Christophe Hache at Tourcoing, Albin studied jazz bass and went on to broaden his electric bass studies in Italy with Adam Nitti, in the UK with Steve Lawson and in the USA with Jeff Berlin and also with the great San Francisco Bay Area bassist Michael Manring. In San Francisco, Suffys met composer-arranger-producer Candace Forrest and jazz vocalist Lua Hadar, inviting them to Lille for a cultural exchange in 2010. Cosmopolitan jazz ensemble LUA HADAR with TWIST of San Francisco, California joins more than 300 exceptional self-released and independent label artists, as well as former major label acts named by Music Resource Group (MRG) as Nominees in The 12th Independent Music Awards (The IMAs), the influential awards program for independent bands and fans. Celebrating the democracy of creativity and meritocracy of talent, The Independent Music Awards honor exceptional independent artists traditionally ignored by mainstream media and big box retailers.